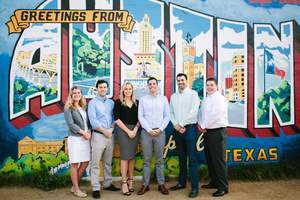 AUSTIN, TX--(Marketwired - Apr 28, 2015) - Betts Recruiting, the leading recruitment firm specializing in revenue-generating talent for tech companies, announced today that they have expanded their business and launched a new office in Austin, Texas. With so many fast-growing companies in Austin seeking to scale and expand, matching the right revenue-generating talent in the right jobs has become increasingly important. Betts Recruiting has a proven track record of matching top sales, marketing, and customer success talent with jobs at the world's most innovative startups and tech firms to include companies like Dropbox, New Relic, Mixpanel, ToutApp, Zenefits -- and many more. Austin is an ideal location for the continuing expansion of Betts Recruiting, as Austin tech firms are coming off one of their best years ever. According to the Built in Austin 2014 Startup Report, during 2014, Austin startups and tech firms obtained $993 million in funding (123% higher than in 2013). Austin was also recently ranked #1 of 12 top global tech centers in a study by property consultants Savills, coming in ahead of San Francisco, Tel Aviv and New York, among others, and getting high marks for its talent pool. Betts Recruiting has been laying the foundation for the Austin launch since early 2014, leading to the grand opening of the Austin office in April 2015. The company recently secured office space in Hannig Row on 6th and Brazos in the 6th Street district. Betts Recruiting's Austin office is under the leadership of Mario Espindola, Managing Director - Southwest, and serves various tech companies that have a presence in Austin, servicing the entire Southwest including Dallas, Houston and San Antonio with marquee clients that include Dropbox, MongoDB, StitcherAds, and Main Street Hub. "Austin is known as 'the next Silicon Valley' and is becoming one of America's most important centers of tech innovation," said Carolyn Betts, Founder and CEO, Betts Recruiting. "As more tech companies continue to launch in Austin or move to Austin, the city is becoming more of a magnet for top tech talent. Betts Recruiting is excited to build relationships, identify and secure the top candidates and source the best revenue generators to go to work for our Austin-based technology clients." Betts Recruiting's Austin clients are excited to have the company expanding to a new location in the city. "I had a great experience working with Betts Recruiting in San Francisco so I was excited to learn they were opening an office on the ground in Austin," said Christy Childers, Recruiter, Dropbox. At first I was worried it might take them a while to get integrated and build a network, but they have far exceeded my expectations on the vast network and impressive quality of candidates they have presented for our available opportunities. While it is difficult for other agencies to grasp our successful candidate profile, the team at Betts has continued to impress me with their understanding of our business and expectations." Betts has been recognized as one of the Top 100 Women-Owned Businesses, and was named one of the Best Places to Work and Fastest Growing Companies in the Bay Area by the San Francisco Business Times. A sampling of Betts Recruiting clients include: New Relic, GuideSpark, Mixpanel, ON24, Radius, ToutApp, Zenefits -- and more. You can find Betts Recruiting on Twitter @BettsRecruiting and on LinkedIn. Betts Recruiting announced today that they have expanded their business and launched a new office in Austin, Texas with office space in Hannig Row on 6th and Brazos in the 6th Street district. Betts Recruiting�s Austin office is under the leadership of Mario Espindola, Managing Director - Southwest.